Stoic have announced that a crowdfunding campaign for Banner Saga 3 is now live on Kickstarter. The 30 day campaign aims to raise at least $200,000. The turn based strategy game originally came to be made after a remarkably successful Kickstarter campaign back in 2012 which allowed the team to raise the bar on production and development plans. Banner Saga 3 will be the third and final part to this epic, story-driven saga. 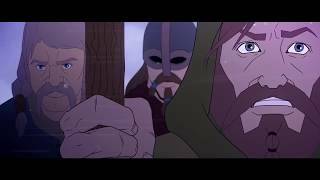 In Banner Saga 3, players will embark on their final journey beyond the wall of Darkness to traverse the world unlike anything encountered in previous sagas. The hand drawn Viking role-playing adventure will once again test the players through tactical battles against adversaries where a player's choice directly affects their personal journey. Kickstarter pledges will be fulfilled by December 2018 - the Banner Saga 3 launch date has yet to be confirmed. There is currently 1 member and 124 guests on the website right now. The Banner Saga 3 (PC) is ranked #313 out of 1436 total reviewed games. It is ranked #9 out of 146 games reviewed in 2018.